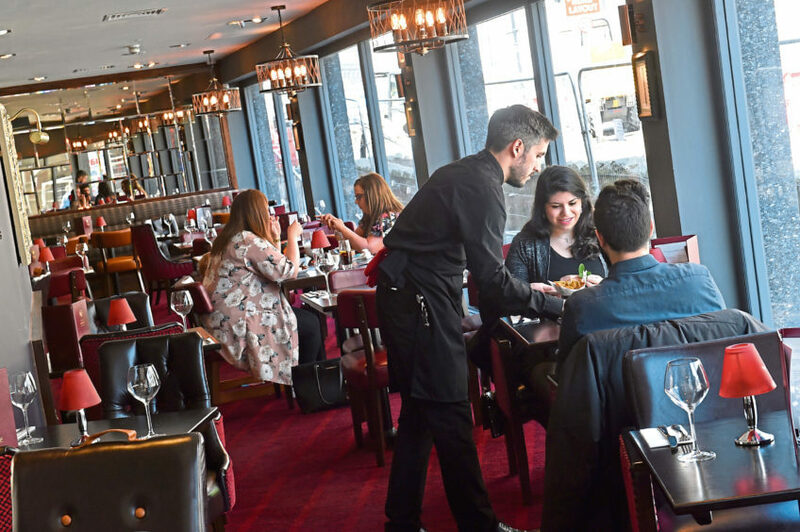 I am not sure how the name Miller and Carter came about, but even although it might sound like an obscure comedy double act, one of its newest restaurants in Aberdeen is drawing a lot of appreciative applause from what I can see. Like any successful performance, it offers flair, attention to detail and quality service. Get that right and the audience usually leaves wanting more. 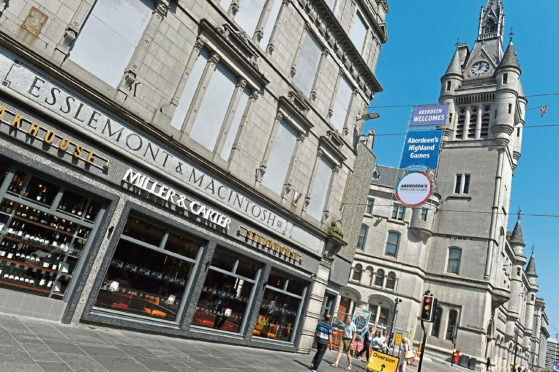 Miller and Carter might also sound like a 1960s department store to some, which is ironic bearing in mind that it resides in some splendour within the walls of the former Esslemont and Macintosh department store at the corner of Union Street and Broad Street in Aberdeen. In the shadow of the magnificent clock tower of Aberdeen town house yards away, this Miller and Carter has bagged a prime spot. This previously somewhat neglected stretch of Union Street was in desperate need of resuscitation. It has all changed now and many will hope Miller and Carter hang around for longer than a certain celebrity chef did a few doors away. 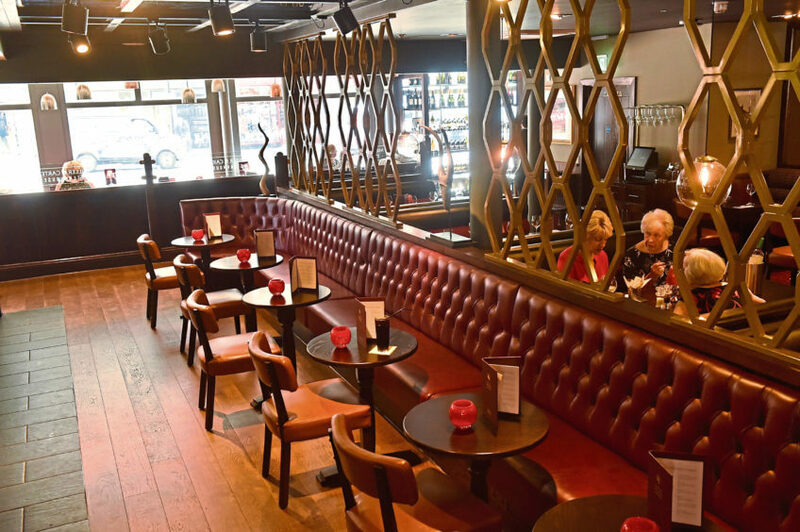 Miller and Carter might be another marketing name within one of the UK’s biggest pub and restaurant groups, but it does have its own distinct character as an upmarket steak joint – in fact, a temple of worship for steak lovers. “We don’t do onion rings, sorry,” we could hear a waitress explaining apologetically to an inquiry a few tables away. They do things in their own way to give a refreshing makeover to what can be a tired and predictable steak, chips, onion rings, mushroom and tomato format in some places. They might not do onion rings, but they do a savoury onion loaf as standard instead. I was still in shock from an online reviewer who gave a right roasting to an M&C elsewhere in the UK and went into a rant over the onion loaf. And it didn’t stop there: the melting speed of a knob of butter on a steak and the quality of paper napkins were also under fire. Why do some reviewers seem as though they are rehearsing for an audition for Masterchef? I am not interested if a supposed expert says they should have used a blow torch on my steak, cooled by fanning flowers hand-picked from the peaks of the Himalayas to finesse it into culinary paradise. All people care about is being treated royally, enjoying special surroundings and an excellent meal that is worth the price. M&C delivered all that for us. We admired the sumptuous surroundings and elegant feel to the refurbishment. 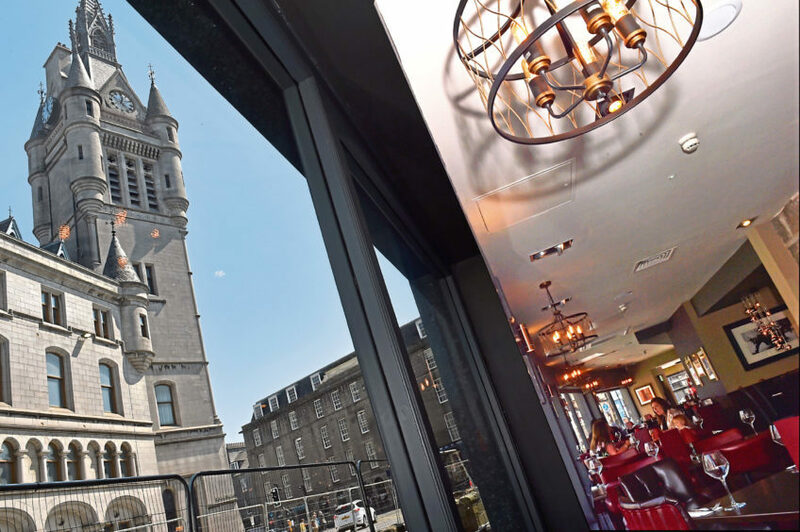 We were in a dining section to one side which looks out on to Broad Street with angled windows and slightly cut off from the main restaurant, which made it a touch more exclusive for us. It reminded us of classy hotel dining with the service to match: for example, our drinks arrived a minute or two after out waitress punched the order into her handset, which sent a message straight to the bar. A lot of patient and friendly advice by staff went into explaining the steak choices. 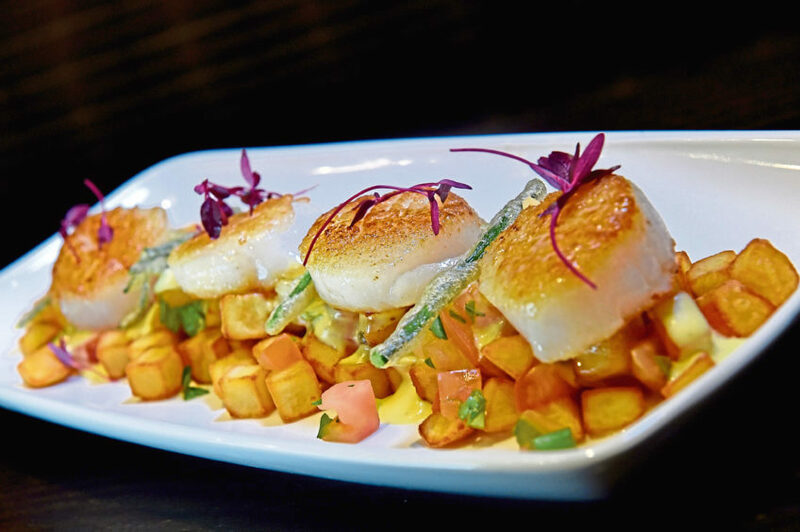 For starters, we ordered Black Pearl scallops, with a scattering of parmentier potatoes, with Champagne sauce and tomato salsa, and king prawns in garlic butter with toasted ciabatta – a delicious prelude to the main event. With so many steaks and cooking times to suit every taste, they have their own special way of letting you know yours is almost on its way: they bring out a lettuce wedge for each diner a few minutes before it is due, covered in a sauce of your choice to peel and add to our steak. My wife chose the most tender of steaks on offer – an eight-ounce premium-cut Scotch fillet aged for 30 days at a reasonable £26.50. 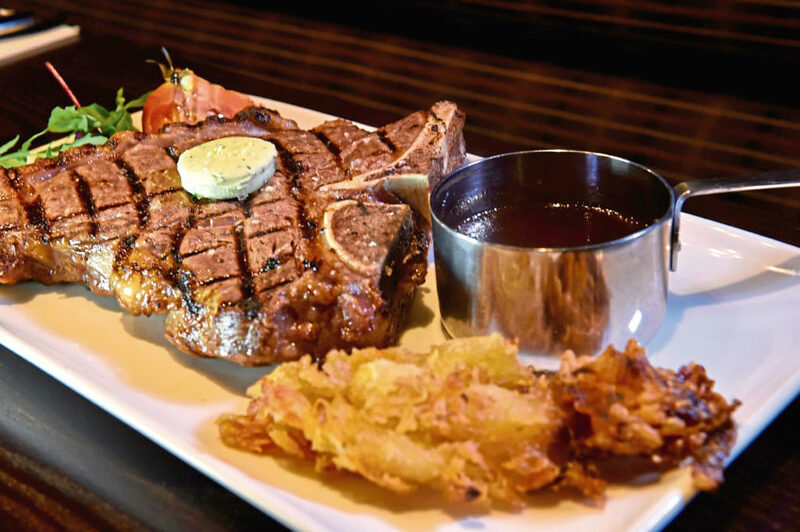 I was venturing into new territory with an “exploration steak from around the world”, especially for aficionados – a grain-fed rib-eye at eight ounces and aged for a whopping 50 days, with a price tag of £22.95. We could have had the same two steaks with an extra Scotch rump thrown in as a sharing platter – known as a 24-ounce Butcher’s Block at a shade under £61, but we would have ended up flat out on a block ourselves after that so gave it a miss. There were around a dozen steaks on offer, with some dazzling sides and sauces. We often find that steak sauces are treated as an afterthought on some menus, but not here with five to choose from and they really helped make the meal something special. My wife had beef dripping sauce (there is a blast from the past) and a rich Bordelaise for me. We added seasoned fries and some melted cheese garlic bread, from the nibbles menu, for good measure. As this had been given such a big build up, the steaks could not afford to fail – and they were absolutely bursting with flavour and tender right the way through. Great value, too, for the price when you think how astronomic they can be. But guess what? You don’t have to have steak – there are burgers, lamb, chicken and fish main courses, too, and a few vegetarian dishes. We rounded off with a selection of three ice creams each, with cookies and Belgian chocolate. 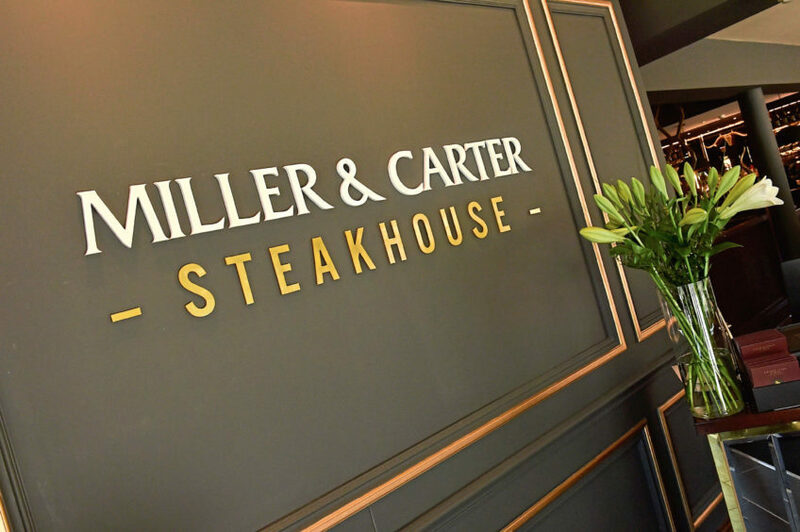 We look forward to a speedy return as Miller and Carter is quite an act.